Diamonds Direct called us to add some new outdoor lighting for their business. 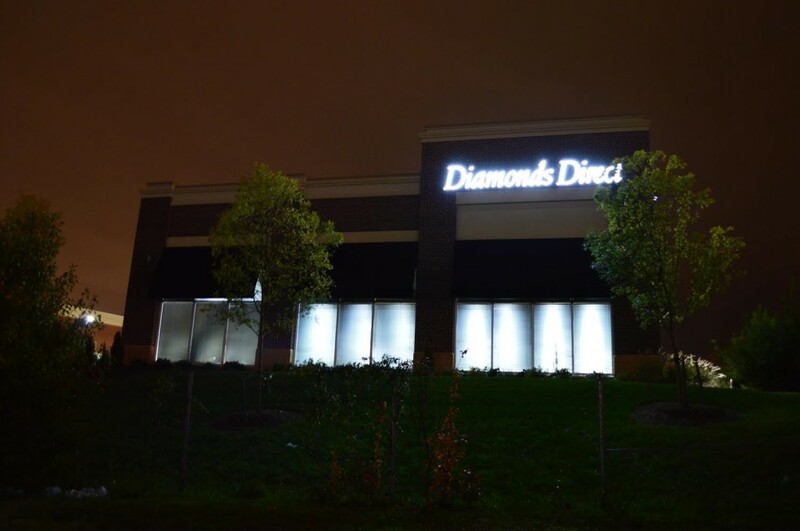 They were interested in seeing what our lighting crew could do to add a more dramatic effect and catch the customer’s attention. We showed up on time and installed some lights and gave them a free nighttime demo. Our customer heard about Virginia Outdoor Lighting from the other great reviews from our previous customers. 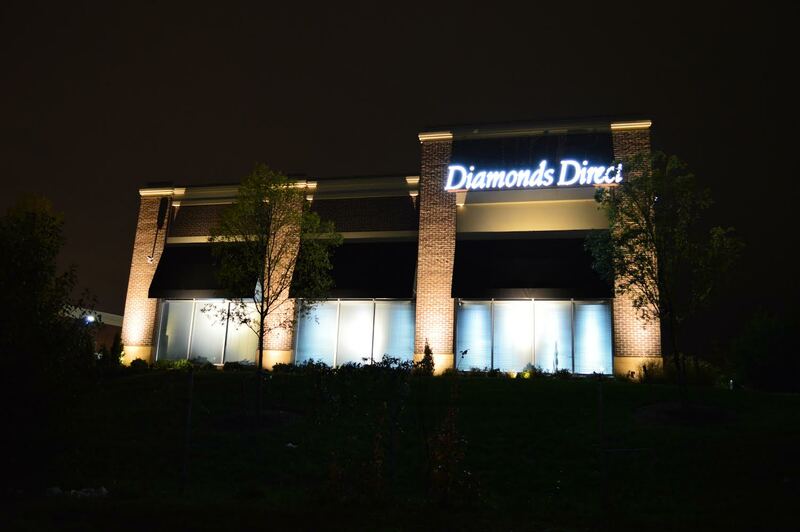 We were able to install some lighting within a few hours and when the sun set, our customers saw the difference that we made. They loved our services and our team! Check out our photos below to see the difference for yourself! For more information on Virginia’s leader in outdoor lighting services, click here! Where Do You Find a Reputable Exterior Lighting Contractor? Finding a reputable exterior lighting contractor is not as easy as just opening up the phone book. When hiring an exterior lighting contractor, there are a few steps a homeowner should take. By taking these steps, you will be sure to have a reputable and qualified exterior lighting contractor to complete your home project. Ask questions. Have the exterior lighting contractor come to your home. Never take a bid or ask questions over the phone. An exterior lighting contractor needs to actually see what type of areas in your outdoor space that you want lighting to be installed to offer advice and suggestions. Make sure the contractor is licensed in your state. Having a state license will let you know this contractor is serious about their trade and profession. The contractor should have proper insurance and provide proof of the insurance upon your request. This will keep you and your property safe from all accidents and responsibility. Get at least three different bids on your landscape lighting. This will allow you to see if all the contractors are close in price and different opinions that each contractor can give you. Don’t decide on a contractor due to price. The old saying, ”You get what you pay for” will be true with your lighting. The lowest price won’t always be the best work performed. Ask the contractor for references and call those references. If the references all tell you what a wonderful job the contractor has done for them, then this is a good sign. Ask the contractor about low-voltage lighting. Any landscape lighting expert will know exactly what this means, but if the contractor does not, then do not work with that contractor. You can ask your friends, family, and coworkers for their contractor. These people all know you and they will give you an honest review of a contractor. Usually, a great and honest contractor has performed work around your town. There are reputable exterior lighting contractors available, but you have to do a bit of research to find one. You can’t just open your phone book and call the first name you see. If you want a reputable contractor, then you must make a few phone calls and spend a little of your time to find the best one for you. To learn more on Virginia Outdoor Lighting, click here! What Questions Should I ask a Landscaping Lighting Contractor? Do you have proper insurance? How much lighting experience do you have? Does the lighting come with a warranty? If I choose your company for the project, how long does it take to install the lighting? What if I am not happy with the finished product? One of the most important questions to ask is if the company has proper insurance. This insurance should cover any accidents that could occur on your property. This would include workers compensation for their employees, plus your property. You do not want to hire anyone that doesn’t have insurance. If someone were to get hurt on your property, you do not want your insurance to pay for the accident. It is good to know if the contractor has reputable past experiences. If the contractor can give you references, then you can call the references and see how the company has performed for them. It is also good to know if the contractor is a licensed electrician. Some landscaping lighting is electrical, not just solar. You do not want anyone wiring into your electric system without the proper qualifications. Many homeowners want to know when they hire a contractor how long it will take for the lighting installation process to be completed. The process will depend on the work that you are wanting done, but many contractors can have lighting installed quickly. What if you are not happy with the finish product? Contractors will try to make their customers 100% satisfied, so if you are not satisfied, they will go over with you the concerns that you have and what you don’t like, then try to change it for you. By the time the contractor is done with the project, you will be thrilled with the end result. Landscape lighting will definitely change the appearance of your home for the better, and remember, asking the right questions will guarantee that you hire a professional and qualified contractor. 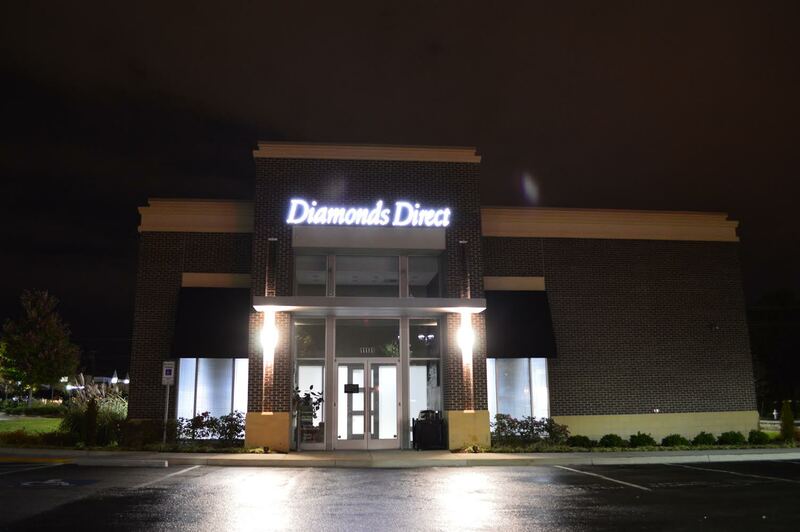 For more information on Virginia’s #1 trusted outdoor lighting company, click here. What is the Purpose of Landscape Lighting? Landscape lighting has many purposes. Illuminating your outdoor space is the main purpose that you can expect with landscape lighting, but there are multiple benefits to landscape lighting that both amaze and thrill homeowners. Landscape lighting offers safety. Lighting areas where people walk will ensure the safety in these areas, as adding lighting around walkways and stairs prevents unwanted and harmful falls. Positioning lighting around the pool, patio, deck and seating area will provide plenty of lighting to ensure safety. Motion detector landscape lighting will illuminate when anything or person activates them. If someone walks through your yard, your lights will come on. This will give you added security for your home. The motion detector lights only turn on when they are activated and can be placed around your home, deterring possible criminals from coming on your property. Landscape lighting can highlight any area of your home. Using decorative landscape lighting around various spots will transform these areas into the focal points of your outdoor space. The decorative lighting can be positioned around plants, waterfalls, and statues – anything you would like to showcase. Landscape lighting adds warmth and appeal to a home. It will show that you care about the appearance of your home and property while also increasing your home’s value. Landscape lighting provides comfort to your outdoor space. Homeowners can add lighting around the patio and deck and enjoy this space when the sun goes down. It will bring a sense of warmth, along with an inviting and pleasant environment as homeowners can relax and enjoy the night in a lit area. Landscape lighting has many purposes and benefits for homeowners. Illuminating any area can be accomplished. Providing safety to your family, friends and all guests will ensure that no one will be hurt while walking on your property. Landscape lighting will also keep your property safe as it can scare away possible criminals from any activity on your property. There is so much that landscape lighting can provide and the purpose is unlimited! If your outdoor space is drab and dark, then now is the time to think about adding landscape lighting to your property. For more information, give us a call today; you will be amazed at how wonderful it looks after it has been installed! Click here to learn more on Virginia’s #1 outdoor lighting professionals. What are the Licensing Requirements for an Exterior Lighting Contractor? Knowing the licensing requirements for an exterior lighting contractor will ensure you that the contractor is a professional and has met and obtained the licenses required to perform your projects. The Licensing for Integrated Building Systems (IBS) explains that low-voltage work varies from state to state and sometimes from city to city. Even if your contractor has the IBS license, you should still check the city that you live in to see if the license applies to your city and if it covers the low-voltage work that is involved in many exterior lighting projects. An exterior lighting contractor may possess certification, which is not to be confused with a license. A certification can be issued by a government agency according to the laws of that locality. It is used by an independent organization or exterior contractor that specializes in a particular specialty of work. Homeowners can find their state listing by visiting www.neca-neis.org. This is the site that has the state licensing and the requirements. The national codes on legal licensing requirements are required by each state and locality. Licensing for exterior lighting contractor requires a specific number of years of hands-on experience. Many states also require contractors to renew their license with educational classes. There are several states that distinguish between contractors and technicians, which can allow for different licenses for residential exterior lighting work and commercial exterior lighting work. However, the contractor is still responsible for meeting all state and locality licensing. The requirements for an exterior lighting contractor will depend on your state and locality. All states and locality may require different requirements for contractors. The key to remember is to look for licensed contractors. Certified doesn’t mean the contractor is licensed, it only means the contractor has been certified by that state and locality. This can be confusing for homeowners, as many homeowners believe when they see ‘certified’ that the contractor has been trained and licensed, when it may not necessarily mean both. Get credentials and ask to see a contractor’s license before hiring any contractor. For more information on Virginia’s Outdoor Lighting experts, click here. What are the Benefits to Landscape Lighting? Landscape lighting is on the rise for homes across the country. There are many benefits and it can make a huge difference for your home, friends, and family. Safety: The safety that landscape lighting can bring to you and your family is a major benefit. The landscape lighting will provide a safe entrance or exit to and from your home. Landscape lighting can be placed near the walkways and driveway of your home. It can also be placed near any potential danger zone of your home such as around the pool, near the dog and stairs. Landscape lighting will illuminate your exterior of your home, working to keep your home safe from danger. Appearance: Landscape lighting will enhance and make the exterior of your home stand out. A homeowner can place landscape lighting around water fountains, plants, pools, or any type of landscaping to bring out the beauty in these particular home features. Items will pop with lighting, working to illuminate your home at night and keep it looking simply amazing. Added Living Space: Landscape lighting will increase living space to your home. With the proper landscape lighting, a homeowner will be able to use their yard even when the sun goes down. Landscape lights can be attached all around the yard and positioned around the patio or deck to bring enough lighting for late night dining or parties. Security: Landscape lighting offers security for your family and any guests that enter or exit your home. The lighting can be positioned around sidewalks, walkways, stairs, and the driveway. It is easy for anyone to trip when they cannot see where they are walking, but the lighting will illuminate these areas to prevent falls or injuries. Value: Landscape lighting can increase the value of your home. When your home has landscape lighting positioned around the property, it will create a rich sense of value to your home property. As you can see, there are many benefits to landscape lighting. Call us today to schedule an appointment to discuss your home or business landscape lighting needs. Click here for more information on Virginia Outdoor Lighting. How Many Lights Will Need to Be Installed to Light The Exterior of My House? Landscaping lights are an excellent ways to light the exterior of the home. It can turn a dark, dreary home into a beautiful masterpiece that is safe and beautiful to look at. If you are looking to have lights added to the exterior of your home, then you are probably wondering how many lights are needed for the installation. The amount of lights that will be needed for your home depends on your home and the type of lighting. The new lighting that is used today provides excellent lighting for the exterior of homes, so homeowners do not have to use as many lights as they think they will need. The best type of landscape lighting that a homeowner can use is line voltage, low voltage, LED and solar. Line voltage allows the homeowner to use a higher wattage bulb. A homeowner can also choose from different type of bulbs with the line voltage. The low voltage option allows the homeowner to be energy efficient with their landscape lighting and also offers ease in installation. The LED lighting offers a longer bulb life along with energy efficiency,and the solar lighting option allows the owner to be totally energy-free and efficient. The solar landscape lighting is very affordable and one of the most popular choices with homeowners. For a homeowner to know exactly how many lights are needed to be installed to the exterior of the home, they should call their local and trusted landscape lighting contractor. The contractor will come out to your home and discuss what type of lighting you are looking at and where you would like to have the lighting placed. Some homeowners only want lighting around the walkways, while other homeowners want to have lighting throughout their property – it is truly up to you! Landscape lighting is affordable and offers more than just lighting to homes. It will provide safety, ambiance, and value to every home with a quick and affordable installation process. If you are a homeowner who wants to add lighting to the exterior of your home, call your contractor today! They will gladly talk over the options that you have for lighting. Now is the perfect time to think about landscape lighting for your home! For more information on Virginia Outdoor Lighting, click here. What Influences the Price of My Landscape Lighting Project? A landscape lighting project’s price includes many different costs based on the homeowner’s lighting needs. The more lighting that a homeowner wants, the greater the price. If there are different types of lighting that the homeowner can choose from, which also affect the total cost. Many homeowners are worried that their landscaping will be destroyed by the landscape lighting installation, but in many cases, a small trenching blade is used to install the lighting fixtures so they are easily placed into the landscaping. A homeowner can have spotlights, in-ground lighting, path lighting, and a light control module added to their landscaping for a very affordable price. You may be afraid to install landscape due to the overall cost, but exterior lighting can be reasonably priced. The price of landscaping is not only affordable, but the lighting is completely energy efficient, such as the LED lighting option. It costs pennies to run this type of landscape lighting and the lights look amazing. A control module is installed to allow you to time when the landscape lighting will turn on and turn off. One of the benefits of having landscape lighting installed is that you do not have to do anything to prepare for the lighting. The professional installers can have the landscape lighting installation process generally done in two days, but it depends on how much lighting the homeowner is requesting. To know exactly what the cost would be to have landscape lighting installed at your home, you should call a professional landscape lighting contractor. Don’t you want to rest assured knowing that the lighting installer does this every day and has the qualification to perform the project effectively? If the price of your landscape lighting project seems too good to be true, it may be the case. When a contractor offers you a price that is so affordable it is unheard of, this contractor might not have the credentials you need to perform your landscape lighting. Call around and get many different quotes before fully committing to one company. Ask many questions to the contractor to make sure they are qualified, trained, and have the experience and knowledge to do your landscape lighting. Landscape lighting can be affordable, but do not let a low price be the most influential factor in determining who will do your lighting. For more information on Virginia’s #1 outdoor lighting experts, click here. Are There Any Dangers I Should Be Aware of With Landscape Lighting? Are there any hidden dangers that a homeowner should be aware of when it comes to landscape lighting? Luckily, the dangers that are associated are minimal, as landscape lighting has improved drastically over the years. Low voltage landscape lighting does potentially have dangers. It has 120 volts of electricity running from the home to the lighting and if the low voltage wiring gets exposed and the weather elements hit the exposed wires, the safety of family members and pets may be at risk. A transformer has to be installed to reduce the voltage power to twelve volts. When the voltage is reduced, the danger lessens if the wiring were to get exposed by the weather. There would be no danger to people or pets with the lower voltage. There is, however, a downside to lowering the voltage; the further away the lighting is from the transformer, the dimmer the lights can be. There are ways that this can be prevented and that is by using heavier cable wires or having a higher transformer. Your family and pets would still all be safe and there would be no danger with the landscape lighting. LED landscape lighting provides no danger. The LED contains no glass components and are very vulnerable. They are free from any toxic chemicals and are completely recyclable. The LED landscape lighting also provides excellent energy efficiency, use less wire to install, and the lighting attracts less insects to your outdoor space. Mosquitoes are attracted to outdoor lighting, but LED lighting attracts less mosquitoes, which is safer for you, your family, and pets. The dangers of landscape lighting are minimal. An experienced landscape contractor should know if your landscape lighting will cause any danger to your home, family, and pets. Using different wiring, lowering the voltage or even adding a higher transformer can minimize all the dangers of landscape lighting. Landscape lighting provides more benefits than danger. The lighting will provide the light that is needed for a safe walk and illuminate your property. Landscape lighting is safe and will create beauty and provide safety to your home. For more information on Virginia’s #1 outdoor lighting experts, click here!